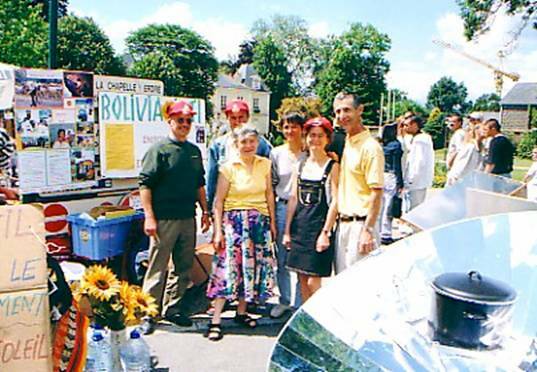 come and celebrate solar cooking's progress with the french organization - bolivia inti. the bolivia inti association of france invites all interested persons to attend their annual celebration at 3la montagne this saturday the 27th of april at the 3george brassin room, at 8:30 pm.ï¿½ there will be a slide show and music of the andes is featured.ï¿½ of course everyone will be interested in the preparations already begun towards executing the 2002 solar cooker project in bolivia. bolivia inti - france has also been very active in training personnel from several african ngos about the benefits of solar ovens and other alternative cooking devices such as wood efficient stoves and retained heat cookers. let us also use this opportunity to announce that the 3la gazelle de puits de bermo2 association is organizing an afternoon about its solar energy projects in niger, saturday the 4th of may 2002 at the nantes hall of manufacturing at 2:30 pm. program details are available from the bolivia inti association's email address below.ï¿½ï¿½ the bolivia inti folks have very close relations with this association and suggest that, if you have the chance, don't hesitate to visit them on may 4.
the french bolivia inti team has just finished the realization of 25 parabolic cookers type sk 14. all are sold. they are built with an association that supports people who are difficult to integrate in the working life. ï¿½soon they begin another series for 25 - sk14s. profit of this operation is converted into solar cookers in bolivia.ï¿½ robert chiron and hernan mercado continue to spread information through every media possible in france (tv, radios, and newspapers). they continue training periods of 2 days with about 12 persons participating every time. ï¿½10 courses are programmed in france for 2002 season: the first was last weekend, animated by jonathan. 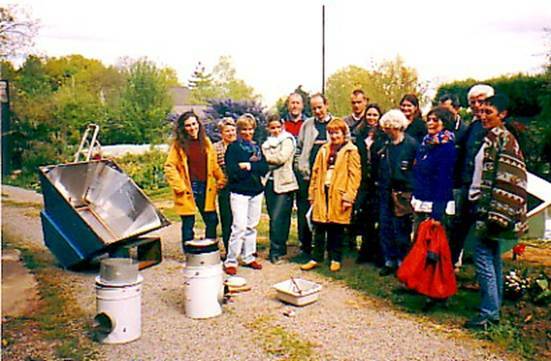 wood efficient "rocket" stoves, solar box cookers and retained heat cookers as taught by bolivia inti expert jonathane herve (first on left) in a recent course in france. provisions, an industrialized country may obtain green house gas (ghg) emission credits by financing a project to reduce co2 emissions in a developing country. in developing countries, each family uses about 4 tons of wood per year for cooking.ï¿½ a solar oven would save 2.2 tons of wood, reducing co2 emissions by 4 tons a year. this represents a reduction of 60 tons of co2 over 15 years, the average life of an oven. an oven and accessories (reflectors and 3 cooking pots) which is expected to last 15 years, costs 86 euro.ï¿½ this amounts to 1.4 euro per ton of co2 mitigated. this is by far the least expensive method available! for 2 billion people, we would need to build 250 million ovens over 15 years (one per family of 8), thus allowing forests to be saved and reducing co2 emissions. cost: 21 billion euro over 15 years, or 1 1/2 billion euro per year.ï¿½ incidentally, how does that compare with the cost of war per year? 250 million ovens would reduce emissions of co2 by a billion tons per year, the total present level of emissions for germany, or twice the reduction imposed on all of europe! we would thus avoid global warming as well as deforestation, and improve the life of 2 billion people who now cook with wood or animal excrement.ï¿½ moreover, not only would co2 emissions be reduced, but the trees thus saved would continue to sequester co2 and produce oxygen.ï¿½ the human benefit of a world plan for solar cooking would be enormous. many people are driven by the needs of their own survival and that of their children, to destroy their natural resources. they will not escape from poverty without outside help. 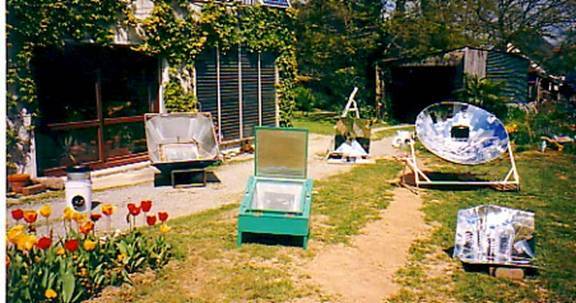 solar cooking is an efficient way to really help avoid a worldwide catastrophe. bolivia inti's method allows families to reduce their wood consumption by 55%, thanks to solar energy which is free, unlimited, non-pollutant, available everywhere, and so abundant in the southern countries!ï¿½ documentation demonstrates that this reduction can be increased up to 80% by combining the use of retained heat cooking and efficient biomass stoves with dedicated solar cooking. last year, bolivia inti projects in bolivia and peru equipped 258 families with solar box cookers and taught water pasteurization, cookit fabrication and other aspect of the theory and use of these devices.ï¿½ join us this year in reaching 1000 families in those countries.ï¿½ we also capacitate facilitators within france and consult with organizations to help them make use of the bolivia inti experience in their activities. this article is adapted from material written by robert chiron, translated by darwin curtis (s.h.e.) and anne sophie leroy, (embajada frances en bolivia) and edited by david whitfield, sobre la roca.